Stock trading may sound both prestigious and complicated, a job of only the elite and wealthy – but that’s just a myth. Anyone can become a stock trader. And it only takes a small amount of money to get started. The hardest part of stock trading is learning the ropes, which takes time. But today, there are affordable online classes that can help you master the stock market in as little as six weeks. If you’re new to stock trading, there are plenty of ways you can learn the ins and outs of trading online. From online courses to bootcamps and academies, you can begin trading in just a few short weeks and learn all you need to know for an affordable price – and you don’t need to have any investing experience. If you’d like to learn the basics of stock trading quickly and efficiently, there’s no better option than Udemy. You can build your own education, taking any courses that interest you from the thousands of finance and stock trading classes available. Udemy’s courses are all taught by industry experts, and you can study and learn at whatever pace works for you. And Udemy’s stock trading courses can be incredibly cheap. Typically priced at $199, the Stock Training Simplified course¹ often sees discounts that make it just $14.99. That’s a more than 90 percent discount – and you can browse the Udemy platform to find similar deals on stock trading courses. Ed2Go works more like a traditional online classroom: when you choose a class, program, or suite of classes on stock trading, you’ll enroll and choose a start date. All courses are offered in partnership with a specific school, meaning they’re recognized by employers and can even be accredited. For $390 you can start your stock trading education with Ed2Go’s Stock Trading Suite², a selection of three courses and 72 hours of learning. Browse this education platform and you’ll find related courses to keep growing your knowledge, as well as a wide selection of finance courses to broaden your understanding and skills. If you want to learn stock trading quickly, but don’t want to forgo the benefits of traditional education, visit Online Trading Academy. This school offers both in-person and online classroom options, teaching you both professional skills and important stock trading strategies that cover all the basics of the job. Taught and supported by real brokers, the Professional Stock Trader and XLT Stock Trading courses come with tuition costs. However, Online Trading Academy³ will allow you to learn by trading your future commissions for the cost of tuition, meaning some students pay as little as $0 to start learning. Once you’ve mastered the basics you need to confidently begin trading online, you’re ready to join some of the best stock trading platforms available. These online trading spaces let anyone begin investing, trading, and earning money with ease. If you want easy online trading without pricey fees, complicated earnings structures, and a low starting investment, you need to try Robinhood. Designed for new stock traders and meant to bring investing to everyone, not just the wealthy, this online platform (and easy-to-use app) is truly a standout. Robinhood⁴ offers a diverse selection of investment options without costly brokerage fees – and you can enjoy zero commission trading. Newer traders can build their portfolios while honing their skills, too, thanks to the Robinhood news feed, helpful tips and stock education, and Collections feature that suggests stocks based on your portfolio. Ally aims to make online stock trading easy, and this is especially true for new traders. If you’ve just finished learning about stock trading, head to Ally for a host of free research, up-to-date charting and data, and analytical tools that all help you make the best investment decisions as you get started. It’s truly designed for new traders, as trading is incredibly affordable at Ally with no account minimum and no annual fee. Nerdwallet⁵ reports Ally’s only cost is the $4.95 fee charged for every trade. Commissions can be earned quickly, and you won’t waste money paying for any extra features or benefits – all Ally traders are on equal footing, with as few costs as possible. E-Trade is an online broker that investors have loved for decades now – and it’s remained so popular because it’s incredibly easy to use. 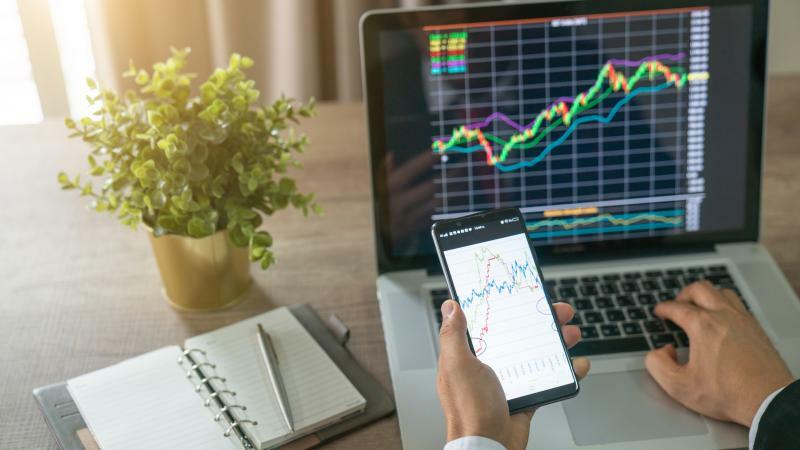 With a suite of investor tools, a big selection of investment options, and the ability to deeply research investments right on the E-Trade platform, trading becomes almost effortless. E-Trade offers a tiered commission structure for traders. The more you trade, the more you’ll make. With just a $500 minimum and a fee of $6.95 per trade according to NerdWallet⁶, this online broker can help you earn money in minutes. Are you ready to start making money that’ll roll into your bank account for years to come? Stock trading is your key to making passive money that’ll build your portfolio, create wealth, and help you set your family up for success for decades. The right investments can bring anyone income for years to come – and it’s easy to get started, even if you have zero knowledge of the stock market. Get started today by taking online courses and learning the ins and outs of stock trading. In just a few weeks – and for a small investment cost – you can become a pro trader. Take your skills to the online brokers mentioned above and you’ll start investing in your future with ease.